The Taiwanese baseball season is upon us once again, with the 2018 CPBL season starting on the 24th of March. The 2018 Opening Day match up will feature the 2017 Taiwan Series Champion the Lamigo Monkeys taking on the Chinatrust Brothers at the Taoyuan Stadium. After dominating the entire 2017 season by winning both the first and second half season championship. The Lamigo Monkeys went into the 2017 Taiwan Series with a one game advantage over the inexperience Chinatrust Brothers squad. Despite dropping game one against the Brothers. The the Monkeys veterans managed to settled down by winning the the next three games to successfully captured the 2017 Taiwan Series. There are many ways to watch the CPBL games during the season, either via the traditional TV broadcast or through several online streaming services. For the non-Mandarin speaking CPBL fans, here are the complete English rosters for all the teams in the 2018 season, along with their uniform number so you can match it up as you watch the game. We put together a list of things to watch for, along with some quick facts to get you ready for the 2018 CPBL season. After the disappointing inaugural season (Finished last with 48-2-70), the Fubon Guardians went on a shopping frenzy in the free agent market with several major signings, which provide them a huge boost in their batting lineup and the pitching depth. It has been a quite an interesting offseason, with each teams trying to poach each other’s foreign players under the table. 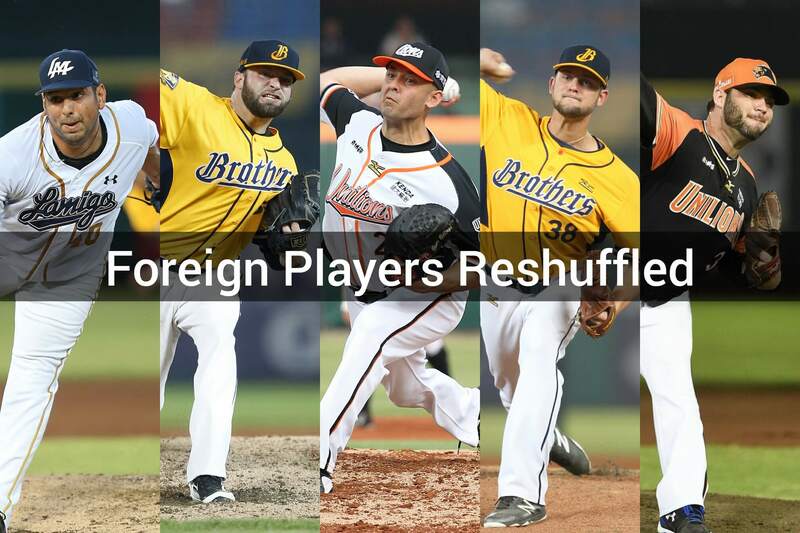 There is a saying in the CPBL, having good foreign players can win your the championship, and it was certainly the case for the 2017 Lamigo Monkeys. Looking deeper into the stats, out of the Monkeys record breaking 78 wins, the three foreign pitchers Zeke Spruill, Darin Downs and Zack Segovia have contributed 41 wins. So for those foreign players that are well adjusted to playing baseball in Taiwan, they tend to become the hot properties during the offseason. As re-signing or poach them is almost a risk-free investment for the team. Below are the list of foreign players that change team in 2018 season. You can find the our complete 2018 foreign players tracker here. Last Season for Wang Po-Jung? NPB, MLB Next? After hitting over .400 in batting average and winning the CPBL MVP for two consecutive seasons, How is the 2017 CPBL batting Quadruple Crown winner 王柏融 (Wang Po-Jung) going to perform in 2018? According to the CPBL regulations, Wang Po-Jung will be eligible for international free agency after the 2018 season. This mean Wang will be able to sign with any NPB and MLB teams if the Lamigo Monkeys are happy with the posting fee. Ever since the beginning of the season, there have been plenty of rumours about the Chinatrust Brothers billboard star 林智勝 (Lin Chieh-Sheng) and the manager Cory Snyder did get get along well with each other. About half way through the season, Lin Chieh-Sheng and several other high profile Brothers players were either got sent down to the farm team or benched and left out of the Brothers post-season roster for disciplinary reasons. Now the question everyone is asking is, will Lin Chieh-Sheng be able to play in the first team this season? Or will the Brothers management continue to bench him and leave him in the farm league? It’s never too early to look ahead and see what personal milestones are within reach in 2018. Here is the full list which we break it down by team and will continue to update it throughout the year. Here is a fun one. Out of 227 Taiwanese players in the 2018 CPBL season. Here are some of the overall stats across the entire league. For more players data, you can find it on the English rosters and league overview page. 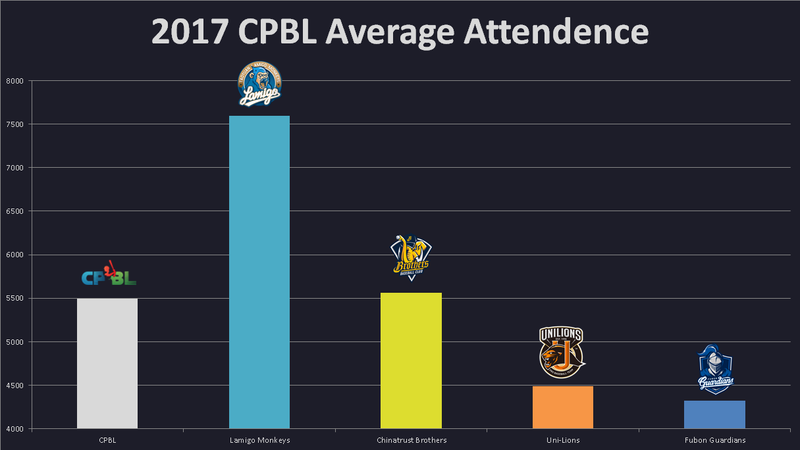 The CPBL have come a long way, from the initial golden day to the game-fixing dark era (Lasted until 2009) and now the rebuilding era where the overall attendance is slowly coming back up once again. The 2018 CPBL season will have the following former MLB players. To keep the list short and manageable, we won’t list players only with minor league experience. For the last few seasons the league’s policy has allowed each team to have up to three foreign players. Generally speaking, foreign players are mostly from the AAA level with some MLB experience. 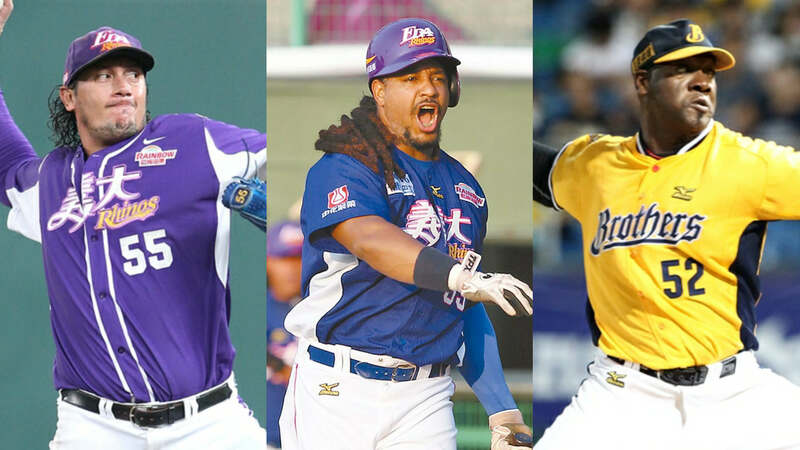 Here is the complete 2018 CPBL foreign players tracker. For a foreign players with AAA experience, the salary structure is normally around 18,000 to 30,000 USD a month not including the post game bonuses. Players with extensive MLB experience like Freddy Garcia, they might earn up to 55,000 USD per month. CPBL was established in 1990 with a four teams structure, after several expansions in 1997 Taiwan reached record high of 11 active teams. However, due to a string of game-fixing scandals, the CPBL is now reduced down to four teams since 2009. Here’s a graphical chart which show the CPBL history timeline. Each team plays 120 games with 60 games each in the first and second-half season. The half-season winner is eligible to advance to post-season. Each team is allowed to carry a 26-man active roster, including foreign players. Each team is allowed to register three foreign players on their active roster and play two simultaneously on the field. August 31st is the trade deadline and the last day to register foreign players for the remaining of the season. Local players acquired after the trade deadline through waiver are not eligible to play in the post-season games. The FA system was implemented in the 2010 season. Players with nine years of service will be granted free agency. Players with three years of service will be granted eligible for international free agency status with the consent of the player’s club. 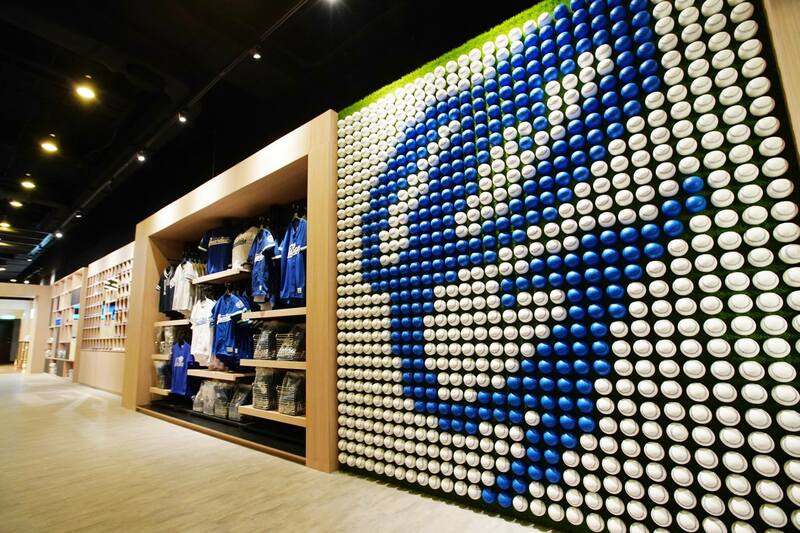 At the moment, fans can buy teams merchandise from the stadium shops during the season, the teams online store or visit the physical retail shops. However, just like the most Asian teams in Japan and Korea, the CPBL teams generally don’t ship merchandise oversea. Unless you are based in Taiwan, or use a third-party post forwarding service, it is pretty much impossible to get your hands on the CPBL teams merchandise. But if you are based in Taiwan, or have a contact in Taiwan that can ship you the merchandise, then this guide on where to purchase CPBL merchandise will be perfect for you. 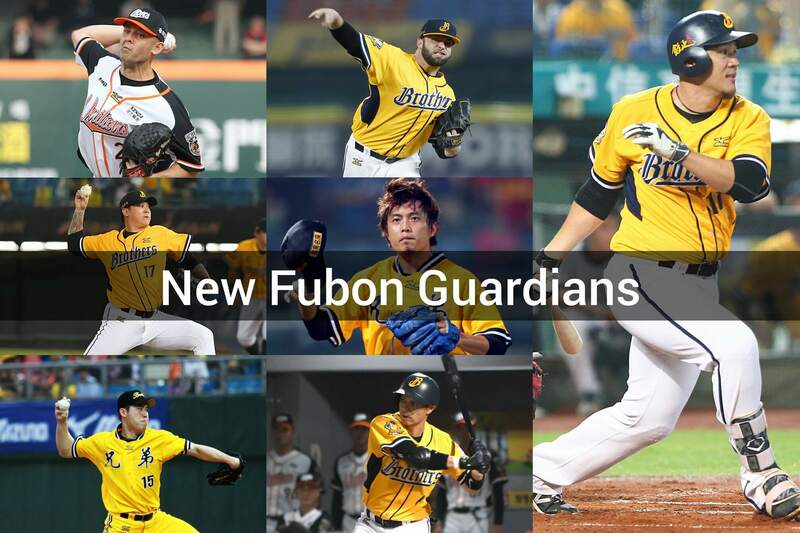 If the Fubon Guardians don’t live up to expectations after all the high-profile signings, it will probably be because of injuries. Most of the big names they have added are at least 30 years old this season. My guess is that Wang Po-Jung will be playing in NPB next season, at least if his 2018 is anything like his 2016 and 2017. It’s too big a jump to the MLB majors, MLB AAA wouldn’t pay him enough (probably half what he could make in NPB his first season), and as a foreign player in NPB, Wang could leave NPB for MLB whenever he wants if he’s successful in Japan. If Wang signed with the Hanshin Tigers, there would be a natural rivalry with Yomiuri’s Yoh Daikan that could be played by Japan’s baseball-mad, but Yomiuri & Hanshin-centric media. It’s hard to imagine the Brothers not playing Lin Chieh-Sheng regularly to start the 2018 season. He’s way too well paid to sit on the bench or play in the minor leagues. If the Brothers think he doesn’t fit with the team anymore, trade him (and eat some of Lin’s salary) and get somebody they want in return. I’m sure another CPBL team would want Lin and his box-office appeal at the right price. I think Guardians are already thinking giving Chiang Chih-Hsien and Chen Hung-Wen more extra time off because they went to play in the ABL during the off-season. As for Wang. I think so too, NPB is more likely than MLB. Would be interesting to see what sort of posting fee Monkeys will be asking to buyout Wang Po-Jung. Oh while we are on the topics of posting, another rumour I recently heard is Guardians’ Lin Yi-Chuan (32 years old infielder http://www.cpbl.com.tw/players/person.html?player_id=R205) apparently couple years ago a MLB organisation offered a minor league contract of $150,000 USD to sign him, but Lin turned it down. Lin makes about 320,000 USD a year right now. The rumour that the things between Lin and Snyder was really bad, it got to the point where Snyder gave the owners of the Brothers an ultimatum “It’s either Lin or Me” But yeah, it is a shame to see Brothers benching Lin, as he is most likely to be the players to set all the CPBL batting record. I think Lin will be a weird situation right now, as a player I think a lot of team will want to sign him, but he is known as the clubhouse cancer, maybe that’s one of the reason why Brothers can’t trade him away to other teams? Noticing today that Chen Yung-Chi is off to fast start and looking at his career stats, it got me thinking that the one good thing for the CPBL with having the best young Taiwanese players signed by MLB and NPB teams out of high school is that these players at least get trained really well before they return to Taiwan. If they don’t make the majors, they are probably the best they can be when they join the CPBL, even if it’s only for the second halves of their professional careers. Yeah agree, that is the benefit of not having a “service ban” policy to prevent young Taiwanese to sign with the MLB and NPB teams. That they are receiving much better coaching and training environment oversea. The question people often asked, if Wang Chien-Ming or Chen Wei-Yin did not go oversea after university but to stay in Taiwan, will they eventually develop the skill to play in the MLB level while playing in the CPBL? And looking from the other angle, will the CPBL game quality improve, if CPBL is able to retain those top amateur players? and if they really want to play in the oversea market, they can after three years of service time. Well, keeping all the best young players in Taiwan would improve the overall performance of the CPBL. The very best Taiwanese players stay in MLB or NPB (and now the KBO) until they are very old. The CPBL gets back better players who peak at the AAA level in MLB but never establish themselves as MLB major league players. Aside from possible better coaching, the MLB minor leagues play long schedules and contain a high level of talent that is a better environment for developing players than CPBL’s minor league, which I think plays only a 72 game schedule, and is not likely playing at an MLB AA league level. I’m not sure that a “service ban” would work for CPBL teams, because signing bonuses from NPB or MLB are simply too high for young players to turn them down solely because they might not be able to play in the CPBL in the future. For example, Wang Wei-Chung is making probably twice as much money to play in the KBO this season than any CPBL player has ever made in a season. Also, CPBL teams simply couldn’t afford to turn away a Taiwanese player of Wang’s ability when his career reaches a point where he’s willing to play for a CPBL salary. Yeah, I also think even with “service ban” it is not possible to retain those players who gets signed for anything above 500,000 USD. I guess the this service ban is to retain those who might get signed for 200,000 to 400,000 USD. Or to put it in another words, to “prevent” them to going oversea. For example, Wang Wei-Chung was signed for 50,000 USD, players like him might end up stay in Taiwan if such a system exist back in the day. Another one is Hu Chih-Wei (Tampa Rays) who was signed for 260,000. As the guy who believe in free market, personally I hate the idea of the service ban, but from league point of view, I think it is the necessary evil. I am a bit on the fence about this issue. But to be honest, I don’t think this policy will ever be in place. It’s not a popular opinion and I don’t think anyone who have a career in baseball would like to back it.